ATP acts on cellular membranes by interacting with P2X (ionotropic) and P2Y (metabotropic) receptors. Seven homomeric P2X receptors (P2X1–P2X7) and seven heteromeric receptors (P2X1/2, P2X1/4, P2X1/5, P2X2/3, P2X2/6, P2X4/6, P2X4/7) have been described. 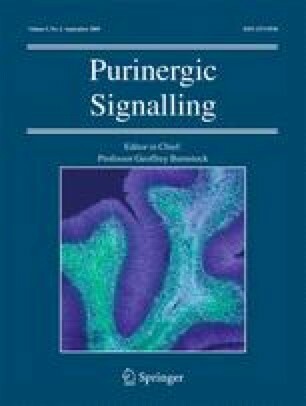 ATP treatment of Leydig cells leads to an increase in [Ca2+]i and testosterone secretion, supporting the hypothesis that Ca2+ signaling through purinergic receptors contributes to the process of testosterone secretion in these cells. Mouse Leydig cells have P2X receptors with a pharmacological and biophysical profile resembling P2X2. In this work, we describe the presence of several P2X receptor subunits in mouse Leydig cells. Western blot experiments showed the presence of P2X2, P2X4, P2X6, and P2X7 subunits. These results were confirmed by immunofluorescence. Functional results support the hypothesis that heteromeric receptors are present in these cells since 0.5 μM ivermectin induced an increase (131.2 ± 5.9%) and 3 μM ivermectin a decrease (64.2 ± 4.8%) in the whole-cell currents evoked by ATP. These results indicate the presence of functional P2X4 subunits. P2X7 receptors were also present, but they were non-functional under the present conditions because dye uptake experiments with Lucifer yellow and ethidium bromide were negative. We conclude that a heteromeric channel, possibly P2X2/4/6, is present in Leydig cells, but with an electrophysiological and pharmacological phenotype characteristic of the P2X2 subunit. We thank Mr. José Fernando Aguiar for excellent technical assistance and Ana Leticia G.C. Maragno for help with the Western blots. Confocal microscopy was performed in the “Laboratório de Microscopia Confocal da Faculdade de Medicina de Ribeirão Preto—USP”. This work was supported by grants from Fundação de Amparo a Pesquisa do Estado de São Paulo (FAPESP # 06/50954-7). LSA had a fellowship from CNPq.